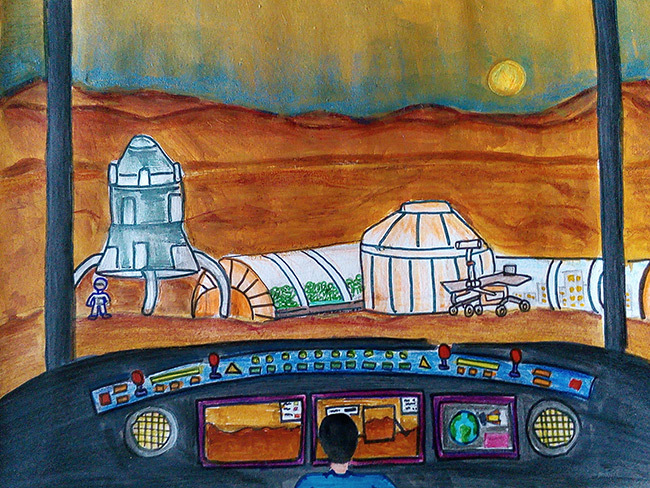 The following are the other entries in the 2017 NSS Roadmap to Space Settlement Student Art Contest. Description: Astronauts work on assembling the modules of the new Weaire Phelan space settlement. They also verify the modules, including the docking and transportation module (on the left side) to perfectly fit into the final shape of the settlement. The entire project of the Weaire Phelan space settlement was sent to the NASA Ames Space Settlement Contest 2017. Tools used: Blender. Description: I want to show in my painting that our future will be bright. Our technology is increasing day by day. 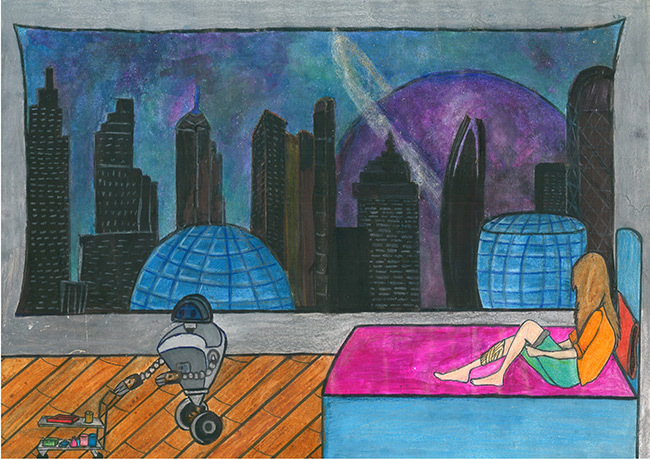 In my painting I show that in our future robots will understand feelings and emotions and will help humans. Humans and robots will understand the value of plants, trees and the environment. And girls will have more freedom and they can do anything like dancing and girls will be ahead all the time and they will be on top. Tools Used: Water colors, pencil, sketch. 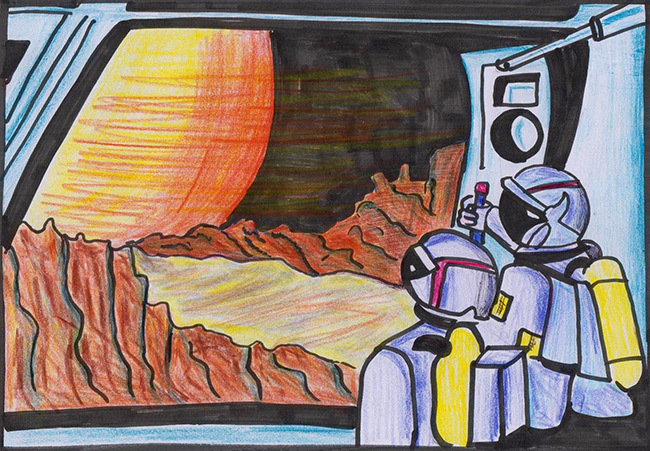 Description: Astronauts enjoying the view from a Martian moon. Tools Used: Water colors, plastic crayons, sketch pens. 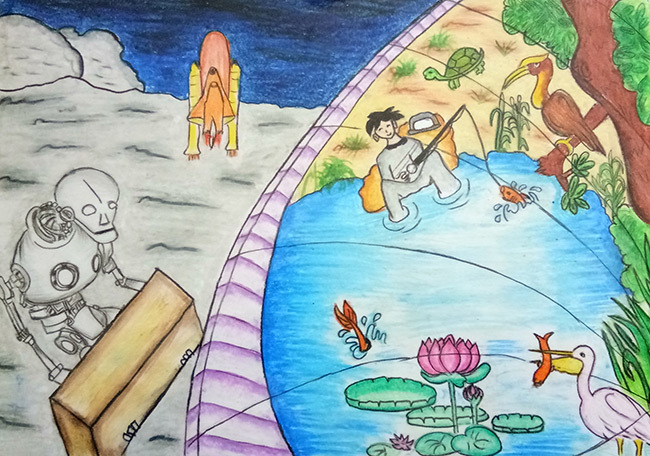 Description: My work of art depicts the pleasure of the astronaut who spending his time enjoying fishing in an artificial ecosystem in a lunar settlement where a whole lot of mundane work is done using artificial intelligence. Tools Used: Oil pastels and charcoal pencils. 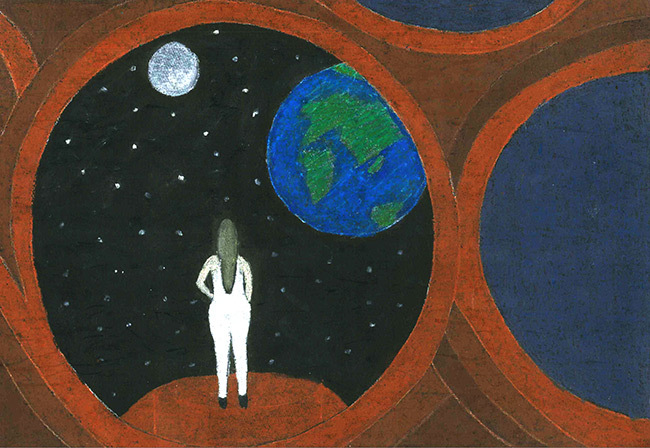 Description: A young person visiting space where humans already settled and are living. He took a self-made satellite to send pictures of the settlemnt to his head office. Tools Used: Pencil and poster colors. Description: My art represents residential torus living. 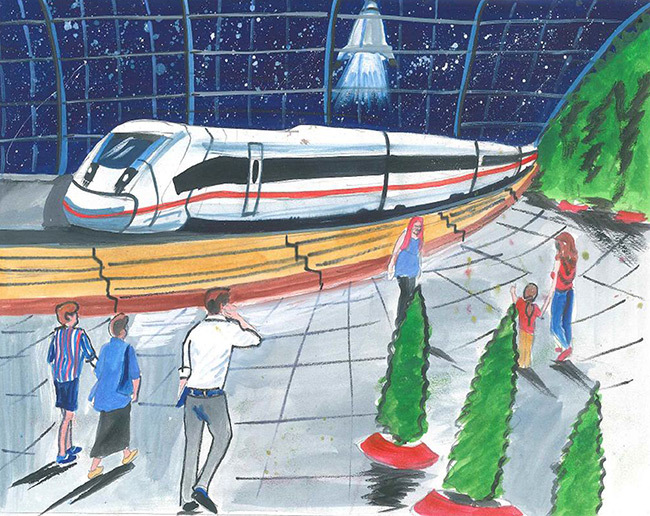 It depicts luxurious houses and comfortable living, parks and transportation, and the daily life of people. 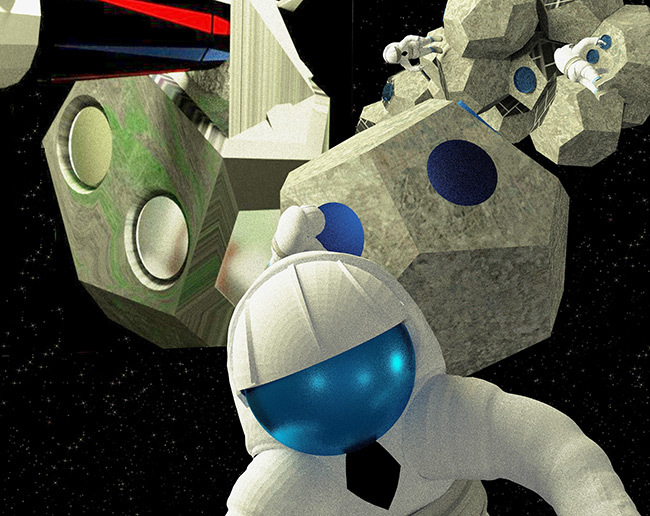 It is a laboratory and research center, being the first step in colonizing space. The habitat has two airlocks incorporated. It also features an agricultural section, a research center and the residential area. People can grow medicinal plants, agricultural plants, and different fruit plants through hydroponics. Tools Used: Poster colors, water colors, marker pen, sketch color pens. Description: People here are mining minerals and ores to keep their space settlements surviving. Tools Used: Pencil, crayons. 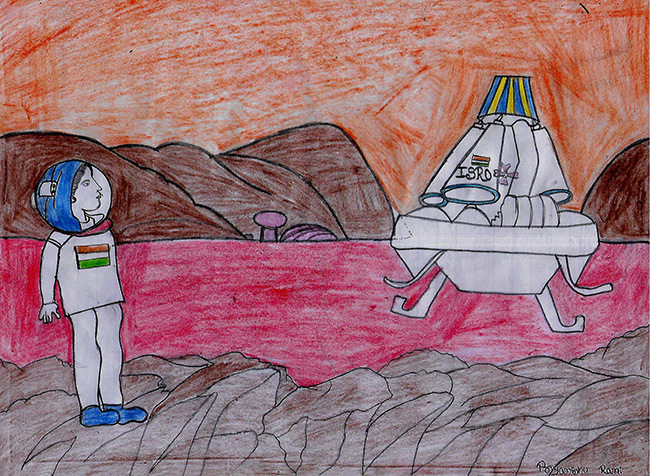 Description: People on Mars searching for life on Mars. Tools Used: Color pencil. 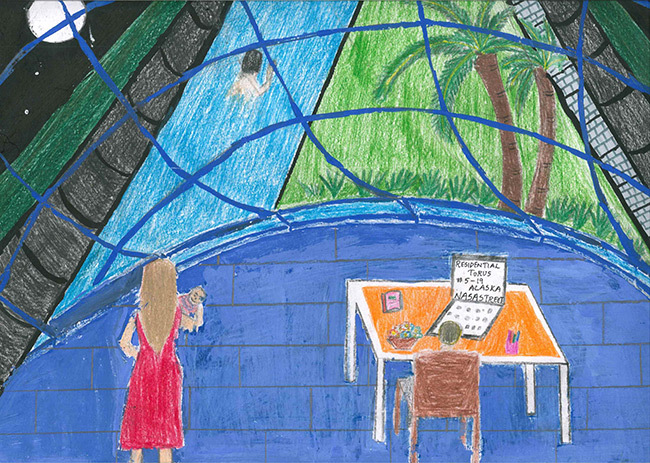 Description: My picture depicts the life style of people inside a space colony. Tools Used: Paint, Photoshop. Description: Ashva Medha Skating Center is constructed on Mars with atmospheric protection layer inside a spherical glass sports area. 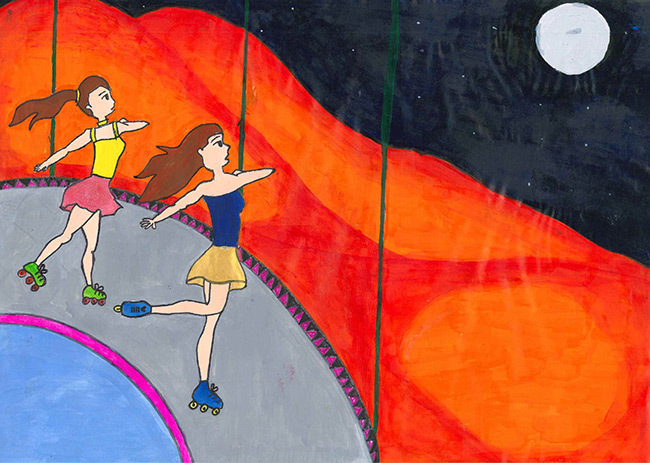 Two girls are practicing roller skating. We see a view of the Martian surface and one of its moons. Tools Used: Oil paint, pencil. Description: This picture depicts a scientist admiring the Earth and outer surface of Nirvana space colony. She is researching for a location to construct a new space settlement. Tools Used: Fabric paint, color paint, black chart. 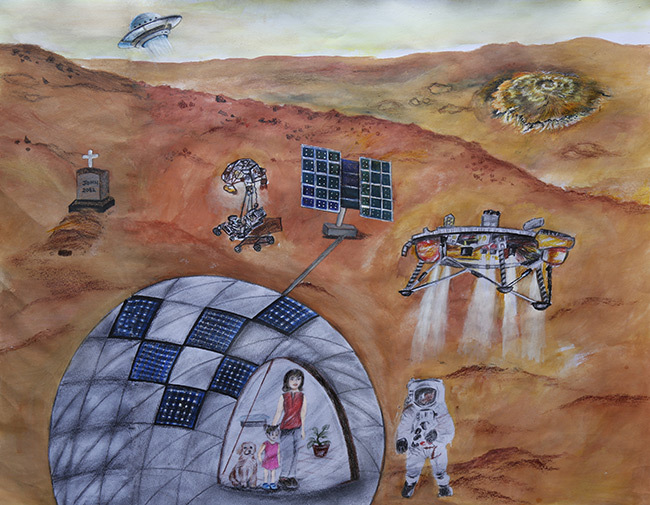 Description: I have tried to highlight the future of Mars. 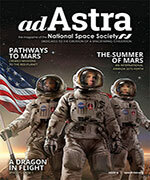 It is time to settle humans with their families and pets successfully using resources available on Mars. Tools Used: Water colors, pencil colors, and Adobe Photoshop. 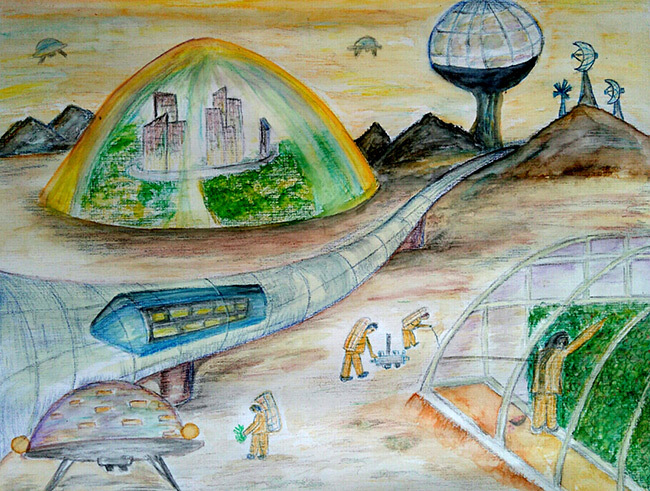 Description: This art shows a depiction of the cross section of a toroidal settlement which is located in low Earth orbit with a view of the Moon. There is a man working on his laptop and a mother nursing her child. There is a swimming pool which offers radiation shielding. A boy is swimming in the pool. Tools Used: Color pencils, paints and sketches. 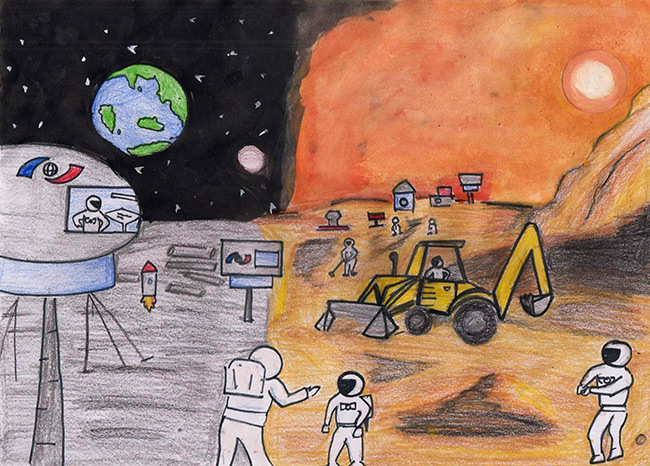 Description: This art depicts that when geothermal activities engulfed the Earth, human settlement shifted to Mars. Everything is rebuilt from transportation, communication, agriculture and residential colonies. 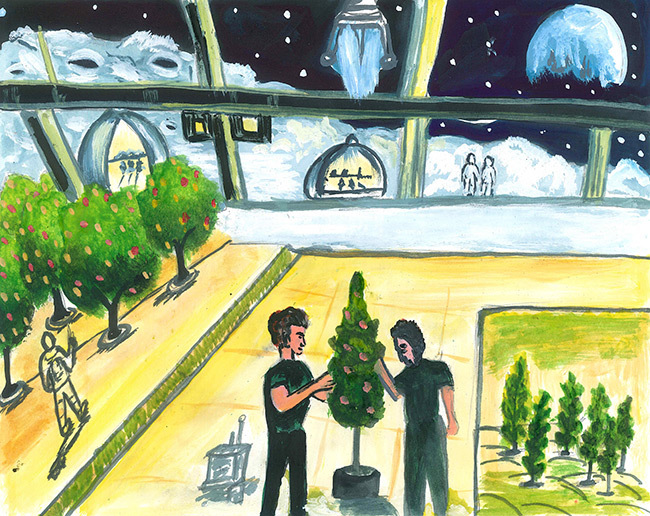 This picture shows people are working on agriculture inside an artificial atmospheric layer.Tools Used: Water color pencils. Description: This picture shows the interior of the space settlement where an injured lady looks out of a massive window which shows the construction of the space settlement orbiting Saturn. A medical robot has just tended her. Tools Used: Water paint, plastic crayons, oil pastel, black marker, white color pencil. Description: Treatment with medicinal plants can have less side effects. 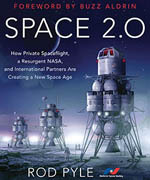 In space colonies we need to secure the people’s life and health and would prefer a system with the least side effects. Medicinal plants are considered a rich resource of ingredients which can be used in drugs. Tools Used: 3dx Max, Adobe Photoshop, Paint. 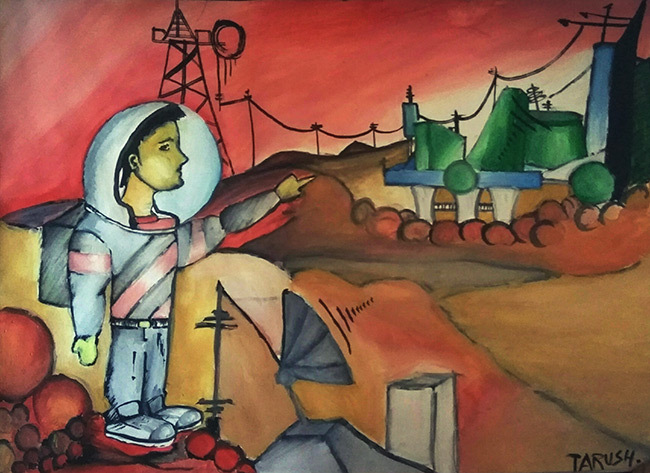 Description: My painting depicts a research center, linked with centers on Earth, working on the human nervous system. Robots do some of the repetitive work. Tools Used: Poster colors, crayons, color pencis, sketch pen, and paint brush. 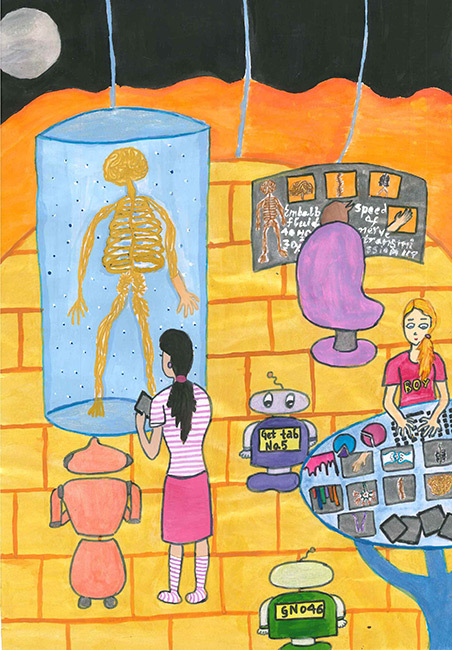 Description: My painting represents the interior of a modernized hospital room in a space settlement at the L-5 Libration point. 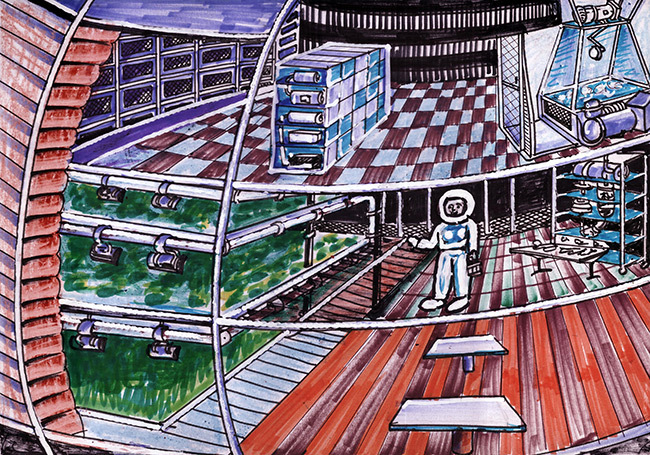 The “window” is a screen through with doctors instruct the robots and which provides a wider view of the space colony. Tools Used: Water colors, plastic crayons. 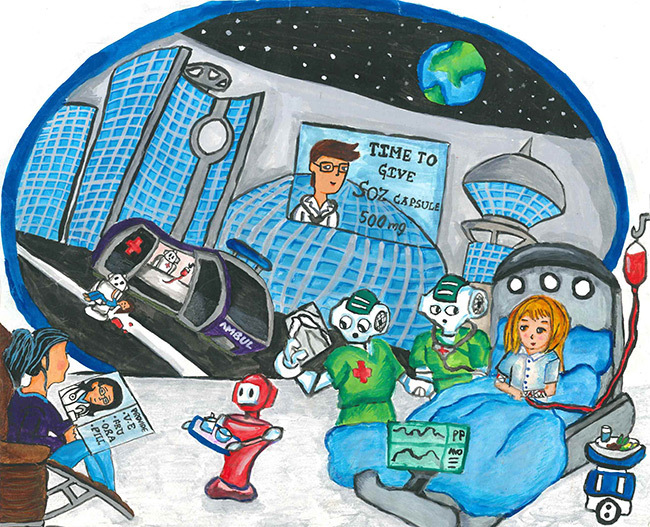 Description: This art depicts the first eye check up in a space colony. Through the window we can see a vast view of the colony apartments and aeroponic gardens. Transportation is on a road using magnetic levitation. 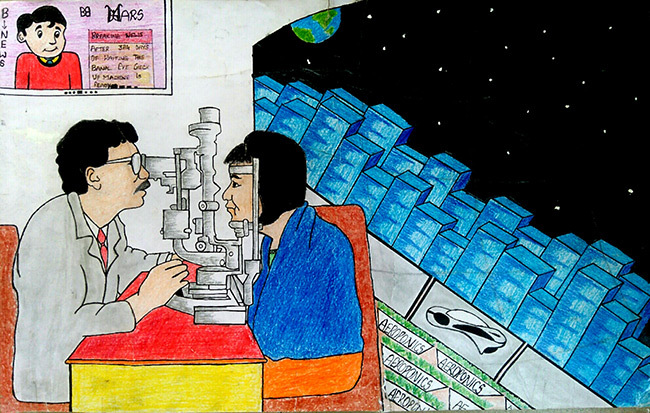 At upper left is a telecast about the successful first eye exam in a space colony.Tools Used: Fabric paints, color pencils. 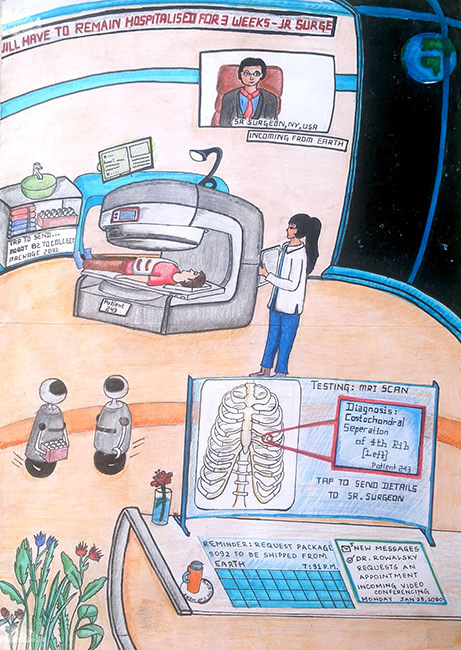 Description: This portrait depicts the treatment of an injured patient in a hospital located in a space settlement. A highly advanced computerized laboratory aids in diagnosing and comfortably treating patients. Telemedicine has accentuated the growth of the medical field, wherein highly specialized doctors help with the treatment from Earth. Tools Used: Color pencils and crayons.